A possible though unlikely image of the upcoming MacBook Pro has circulated on the internet this morning and appears to have originated at German retailer T-Systems.de. T-Systems is owned by Deutsche Telekom, the parent company for T-Mobile. 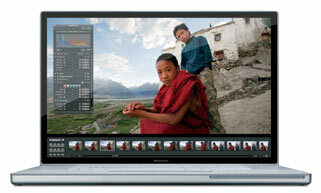 The image depicts a MacBook Pro with a black bordered screen design similar to the currently shipping iMac. 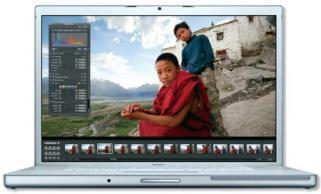 The image itself is very similar to a circulating promotional image (above) for the existing MacBook Pro, though there are some key differences. The MacBook Pro appears to be thinner, and there appears to be no latch and no visible camera. The specs listed on the landing page are the same as currently shipping MacBook Pros. The assumption is that the image itself was unintentionally swapped out on T-System's website. The size of the retailer makes it unlikely that this is simply a publicity stunt on the part of T-Systems, but the chance that any retailer would obtain early images of an unreleased MacBook Pro is extremely low. Apple keeps retailers in the dark about system updates until the very last minute. Promotional images are only released at time of launch. We originally posted this to our Page 2 but have moved it to Page 1 due to ongoing interest in the image. The discussion thread is already in progress. Update: Per MacWelt.de reports: "They've told us that the agency that feeds the shop wasn't satisfied with the product pictures they received. So they've googled for pics by the product name and obviously found some fakes. Due to a lack of mac-wisdom they didn't notice the fake."